Rocksteady's spectacular setting is still great today. In Why I Love, PC Gamer writers pick an aspect of PC gaming that they love and write about why it's brilliant. Today, Andy revisits the least secure high security lockup in games. Arkham Asylum regularly features in Batman stories, usually because The Joker or some other supervillain has escaped from it. Here, though, the asylum is the star, fleshed out as a setting like it never has been before. Later Arkham games took Batman to Gotham City, dramatically increasing their size and scope in the process. But there’s something compelling about how Asylum focuses on one hyperdetailed setting, giving it a rich sense of history and of place through some of the finest worldbuilding you can find on PC. Where I grew up there was a stretch of woodland behind my house. Far in the distance, poking out of the trees, I could see two immense black spires. These belonged to a psychiatric hospital built in the 1800s, around which rumours of escape and murder would swirl. All playground nonsense, of course, but enough to make an imprint on my imagination. It’s this outdated idea of what an asylum represents that fuels Arkham Asylum. A terrifying, Gothic place where the screams of patients echo along tiled hallways and voices mutter from padded cells. Matters of taste aside, it makes for an effectively grim, atmospheric setting – especially for someone who grew up near one of these buildings and saw the spires through his bedroom window every night. It’s when Batman arrives in an area called Arkham East that the scale of the setting becomes clear. 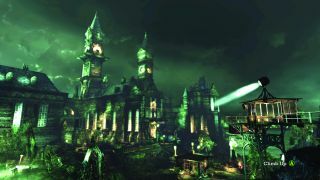 This large, open hub area is among the most impressive-looking parts of the game, illuminated by an oversized, glowing moon and dominated by the spires of the Arkham mansion – a grand old house the asylum was built around. On the horizon you can see the skyline of Gotham, giving you a sense of just how isolated Arkham Island is from the rest of the city. You have some freedom here to grapple and glide around, and while it’s miniscule compared to Arkham City, it was the one place, before the sequels, where you’d feel the most like Batman. For the most part, this is a game that takes place indoors. But the imaginative, exaggerated architecture of the interiors means it never feels claustrophobic or repetitive. You even get to visit a Batcave, which the forward-thinking Batman built under the asylum in case there was ever a catastrophic breakout. Other locations include the Botanical Gardens, a vast glasshouse filled with greenery that becomes the unofficial headquarters of Poison Ivy. There’s the Penitentiary, where the most dangerous patients are kept, and where you’ll find clues to who occupied the cells before the breakout occurred—one is scrawled with question marks. There’s also the Visitor Centre, where Joker will taunt Batman on a TV screen attached to a mannequin of himself. It’s a single location, but an impressively varied one. Revisiting, I’m reminded of BioShock’s Rapture—a large, interconnected setting, split up into a variety of distinctive areas. There’s a sense of history wherever you go, filled in by audio recordings and environmental details. Rocksteady had the benefit of decades of Batman mythology to utilise, and it’s an incredibly well-realised place. Another thing I love about the setting is how it isn’t static. Over time you see the place being vandalised. Statues of the warden are defaced. Signs are hung up welcoming Batman to ‘Joker Asylum’. And after encountering Poison Ivy, her plants burst out of the ground and wrap around the buildings. This gives the sensation of time passing, and creates the illusion that stuff is still happening on the island even when Batman isn’t there. I don’t know if Arkham Asylum is the best game in the series—the refined controls and increased scale of City and Knight are hard to ignore—but there’s something to be said for the more focused structure of Rocksteady’s first attempt at bringing the Batman universe to life. Perhaps its greatest achievement is taking something as familiar and welltrodden as Batman and making it feel brand new. I’d like to see more developers take this approach to existing mythologies; picking one location and laser-focusing on it, using it as way to see that particular world through a different lens.